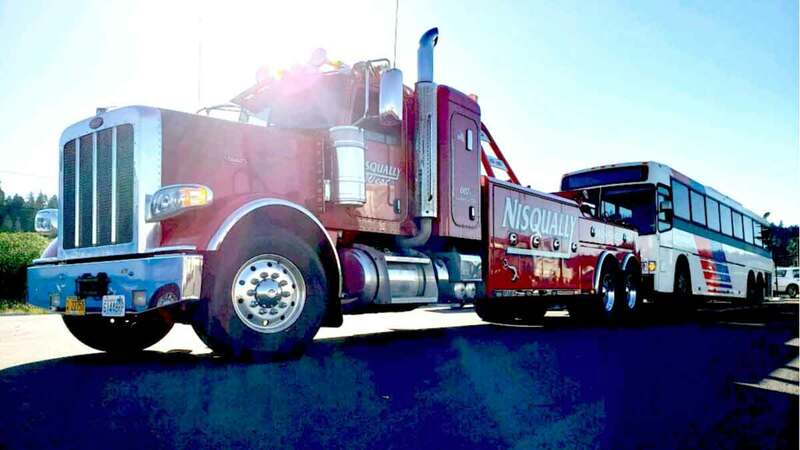 Olympia heavy towing company, Nisqually Automotive & Towing provides heavy towing services in Olympia, Lacey, Tumwater and greater Thurston County. Our heavy truck towing service area extends throughout Southwest Washington to include Aberdeen, Shelton, Centralia, Grays Harbor Co., and Mason Co. Our fleet of 3-axle heavy wreckers allow you to rest assured that we can tow your big truck to any point in Southwest Washington or throughout the country. 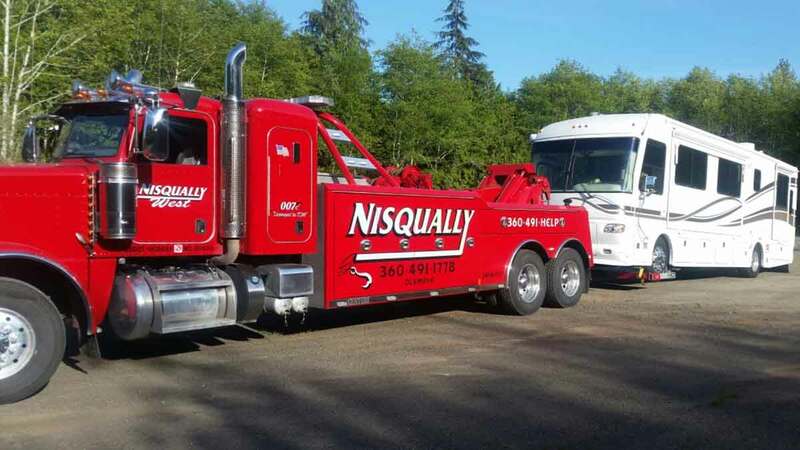 Nisqually Automotive & Towing’s fast response heavy towing operators have the knowledge to recover and tow your asset as quickly as safety allows ensuring you’re back on the road ASAP. Call our 24hr Heavy Duty Towing Dispatch Line at 360-491-HELP (360-491-4357). 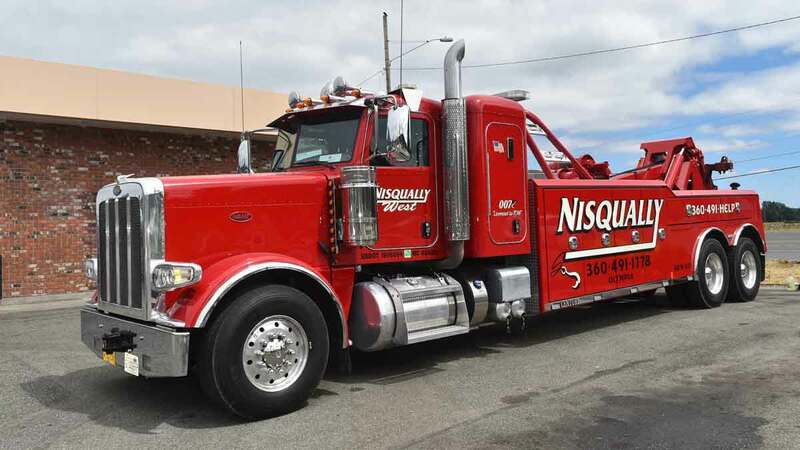 Nisqually Automotive & Towing maintains a huge fleet of towing and recovery vehicles, cargo handling assets and personnel prepared to resolve any heavy transport recovery issue. We provide heavy towing services for all types of trucks including: semi-trucks, city buses, delivery trucks, work trucks, tractor trailers, utility trucks, box trucks, garbage trucks and more. Our team of professional semi-truck towing experts are ready to respond to your heavy towing needs 24/7/365. RV towing company, Nisqually Automotive & Towing provides expert and trusted RV towing services and motor home towing services in Olympia and throughout the greater area. Surrounded by state forests, national parks, camp grounds and other area attractions, we are no strangers to professional RV towing, camper towing and motorhome towing. We have years of damage-free RV towing experience and can haul your RV, bus or motorhome with our fleet of heavy duty wreckers and drop deck trailers. The heavy towing team at Nisqually Automotive & Towing is your safe choice for Olympia RV towing. Call our 24hr dispatch center now at 360-491-HELP (360-491-4357).